There are a lot of measures taken by the Game Of Thrones cast, crew, and writers to ensure the scripts and plot details remain a secret. Even after the season is over, it seems like they're still feeling a pressure to be vigilant and keep secrets hidden. After the shocking Game Of Thrones Season 5 finale aired in June, the internet has been going buckwild with theories about who's dead and who isn't. Season 5 really wrung us of any hope that anyone in Westeros, or the Free Cities, or across the Narrow Sea, would ever find happiness, and left the series on an extremely bleak note. In post-season interviews with the cast and crew, it appears to be an atmosphere of aftershock. It seems even the actors were confused about what was really going on in Season 5. George R.R. Martin has been being pestered so much about spoilers for the sixth season that he took it upon himself to ask fans to lay off, presumably so he could dedicate all of his attention to finally finishing The Winds Of Winter, the next book in the A Song Of Ice And Fire series. Kit Harington has been scrutinized up and down and sideways about whether or not his character is truly dead. Audiences have also looked to the actors' Game of Thrones contracts for clues about their longevity. Everyone wants answers, and even though the cast and crew are still pretty tight-lipped, a few of them have dropped details about Season 6 in their post-season interviews. In an interview with MTV's Josh Horowitz, Emilia Clarke was awfully wishy-washy and vague about Jon Snow's death. "Do you think he's gone for good?," the 28-year old actress was asked, to which she said, "They know I can't lie... I'd say it was about 50/50." Why? Because, according to Khaleesi, she thinks it's pretty suspicious that there's so much magic surrounding Jon, like Melisandre at the Wall, for example, that could do a number to bring him back. We want to believe her. But the saddest boy in Westeros tells a different story. In an interview right after the shocking season finale, Kit Harington said that he felt incredibly relieved. "It feels like I've been sitting on this big f**king secret," he told Vulture. "Jon dies. It's final. He's dead." Too bad for Kit, no one listens to him, which is apparently something he and Jon Snow have in common. The speculation is still rampant about the theories that could bring Jon Snow back from the dead. Another WTF moment in the Season 5 finale is when Stannis Baratheon meets Brienne of Tarth, who, it seems, kills him to avenge Renly Baratheon. If you don't recall, Stannis and Melisandre had a scary shadow monster baby that murdered Renly, who Brienne was loyal to. But that death seemed even MORE vague; you never see Stannis' body, which in any good narrative, is a tell tale sign that character might still be alive. But David Nutter, the director of the Season 5 finale episode "Mother's Mercy," left really no wiggle room when he confirmed the death to Entertainment Weekly, "From the very beginning... that was the intent. He's dead." Well, at least we have closure? Alfie Allen told Conan O'Brien when the Game Of Thrones cast took over his talk show at Comic Con that the writers can dole out cruel and unusual punishment to the actors, and not just through the scenes they have to play out on-screen. Alfie Allen, who plays Reek, the dude formerly known as Theon Greyjoy, said that he was pranked hard by the writers when they took the time to write an elaborate fake script of his death (where Bran stabs him at Winterfell). Of course, because the writers are totally unpredictable, Allen thought it was legit, and a good way to go. "I thought it would be memorable!" the actor said. 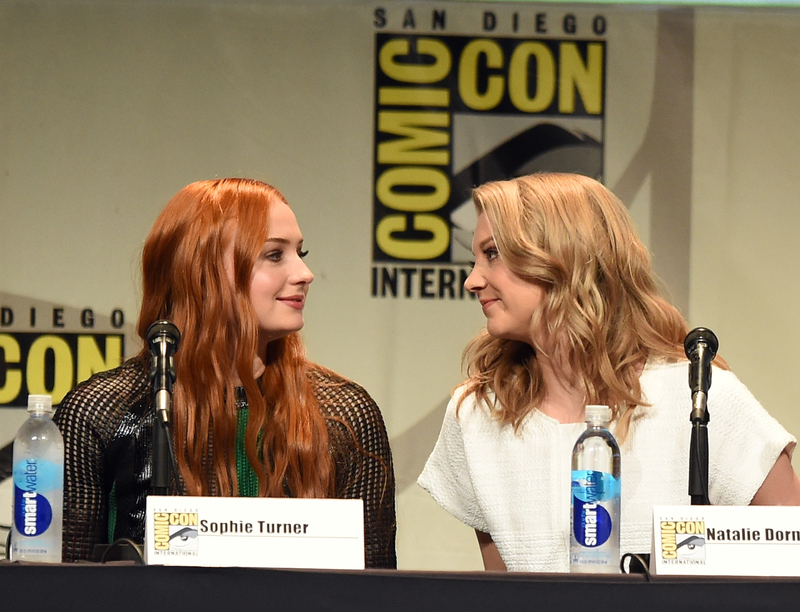 When the Game Of Thrones cast took over Conan at San Diego Comic Con over the weekend, the most disturbing news we learned was not about the upcoming season or the imminent deaths of any characters, but that we almost didn't have our Arya Stark. Conan asked Maisie about her Game Of Thrones audition, which she nearly missed by a hair: "I wanted to go on a school trip to a pig farm," she said. "Because I was really down for that... I don't know what I was thinking," she said. I get it, Maisie. Babe: Pig In The City is a GREAT movie. Some of the lucky cast members of the HBO show have already received and read their scripts for the upcoming season. When asked to describe the next season in just one word — a tough task for anyone in Westeros — their answers confirmed one thing: the shocking deaths, twists, and alliances have no chance of stopping. Could the sixth season be even more intense than the fifth? Alfie Allen called the sixth season "unpredictable," while Jon Bradley, who plays Samwell Tarley, couldn't limit his words to just one, describing the Season 6 scripts as "Rich. Bursting with ideas. Game of Thrones has always been bursting with tiny details, and the first few scripts we've received are absolutely following that trend." We're ready for all those tiny details, and we're ready for the actors and writers to burst under the pressure of being asked over and over again who's gonna die next season. Just give the people what they want — spoilers!